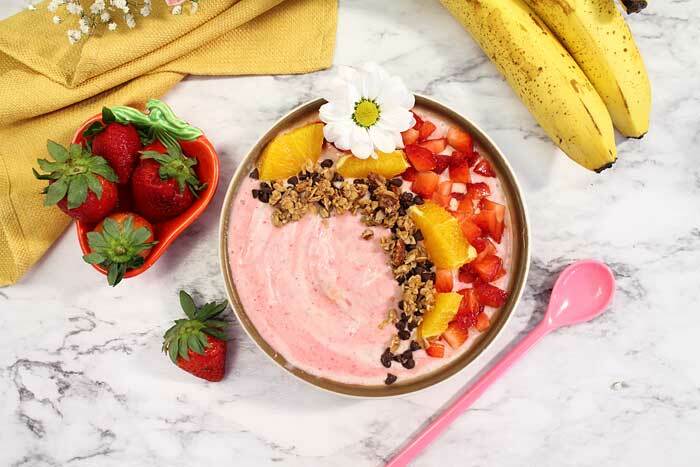 This Strawberry Banana Smoothie Bowl is not only delicious but easy to make and healthy too! A recipe that combines all things summer, strawberries, orange juice and bananas. It’s the perfect tasty, nutritious breakfast to start the day. Smoothies are my go-to breakfast, and sometimes lunch, throughout the year. 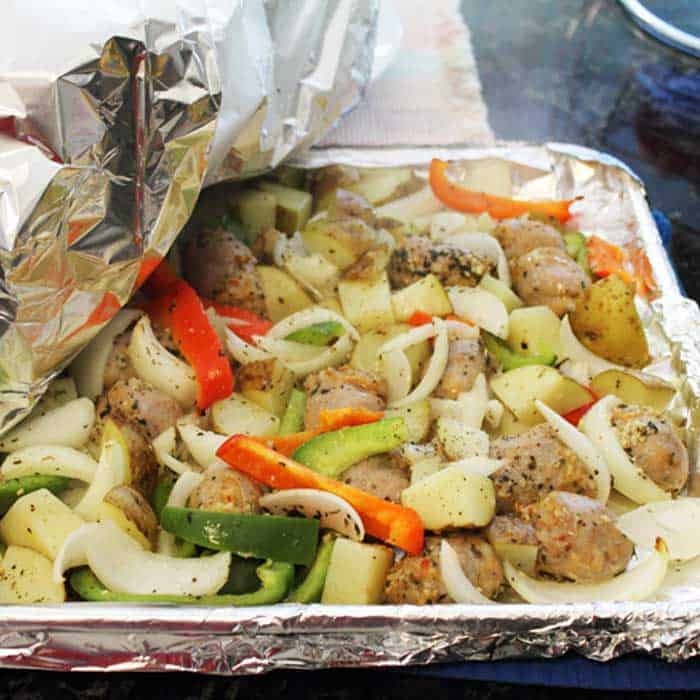 They’re easy to make, healthy to eat and a great grab-n-go. 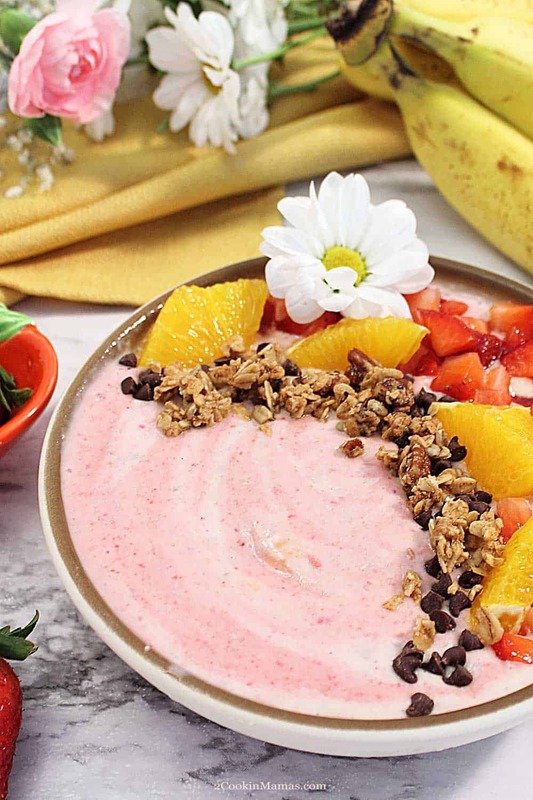 I particularly love this smoothie bowl because it packs so many nutrients into each spoonful. Plus it tastes like you are eating a Strawberry Milkshake and there’s no guilt! What exactly does a strawberry offer in the way of nutrition? Strawberries are rich in vitamins C and A, potassium, folic acid and fiber. Just one cup of fresh strawberries contains 160% of your daily vitamin C requirement and all for only 50 calories! They are also full of antioxidants which reduce the risk of heart disease, certain types of cancer and diabetes. Want healthy skin and hair and more energy? Eat at least 2 cups of fresh fruit and 3 cups of fresh vegetables every day and you are well on your way. 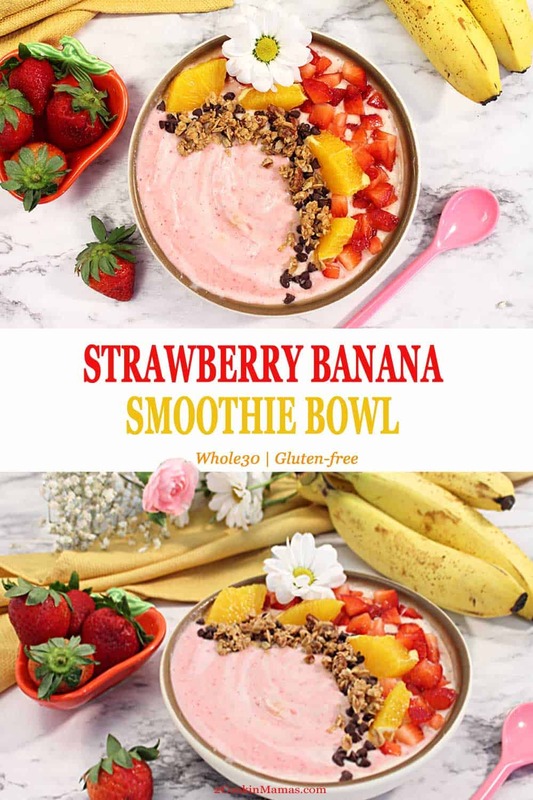 Now, besides the all important strawberries in this smoothie, you also benefit from its other ingredients. 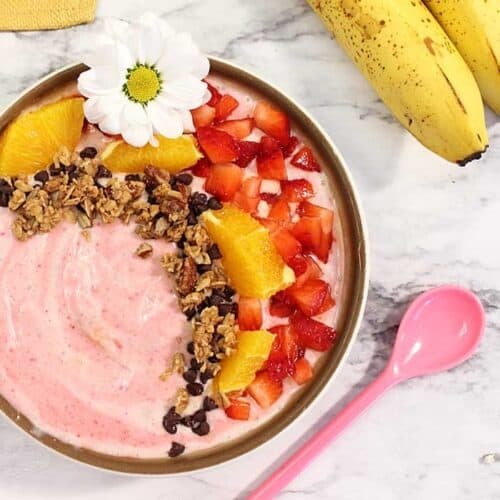 Yogurt, whose probiotics can boost the immune system and promote a healthier digestive track, also contains calcium, vitamins B2 & B-12, which maintains red blood cells, and additional potassium. The chia seeds, the new wonder health food, are rich in omega 3’s helping to protect against heart disease and inflammation and also aids in reducing blood pressure and controlling blood sugars. Wow! Smoothies are an adaptable meal replacements, especially good to have in the morning or before a workout. You can add protein powder for energy, whole fruit for fiber and greens for nutrients. Don’t like strawberries? Change out the fruit to one you do prefer such as peaches, mango or blueberries. It’s all delicious! And, if watching your weight, stick to just one a day as they do contain quite a bit of natural sugar from the fresh fruit. Frequently asked questions about smoothies. Can I make a smoothie without ice? Of course you can. 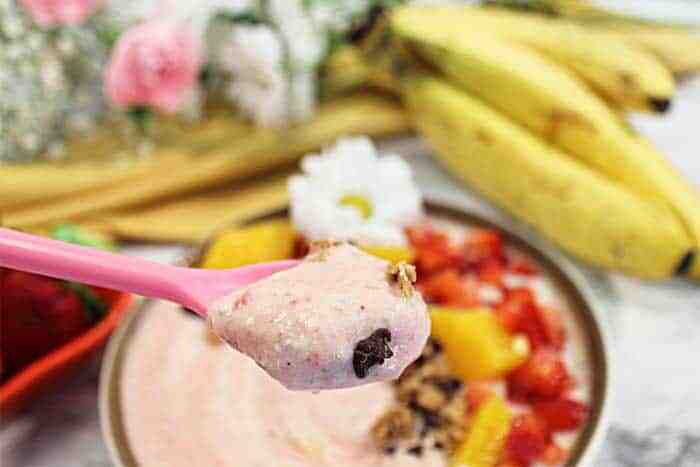 Just add frozen fruit in lieu of ice and you will achieve that soft-serve ice cream texture that is perfect to eat with a spoon. Do I have to make a smoothie with yogurt? No, yogurt is not necessary in a smoothie, although it does add protein and give the smoothie more smoothness and texture. You can add ice or frozen fruit as well as other dairy such as cream cheese or cottage cheese. You can also add a spoonful of instant pudding mix which would add both flavor and a little more texture. Can a smoothie be dairy-free? Yes and with just a few minor tweaks to most recipe. Just switch out the yogurt for an almond or soy variety and, if a smoothie calls for milk, add your favorite type of non-dairy milk such as almond or cashew. Pro-Tip: Don’t have any ripe bananas to freeze? Ripen bananas quickly by removing peel then placing on a cookie sheet in a 300 degree oven for 15-20 minutes. This will bring the sweetness of the banana to the fore and make them perfect for freezing for a quick smoothie. 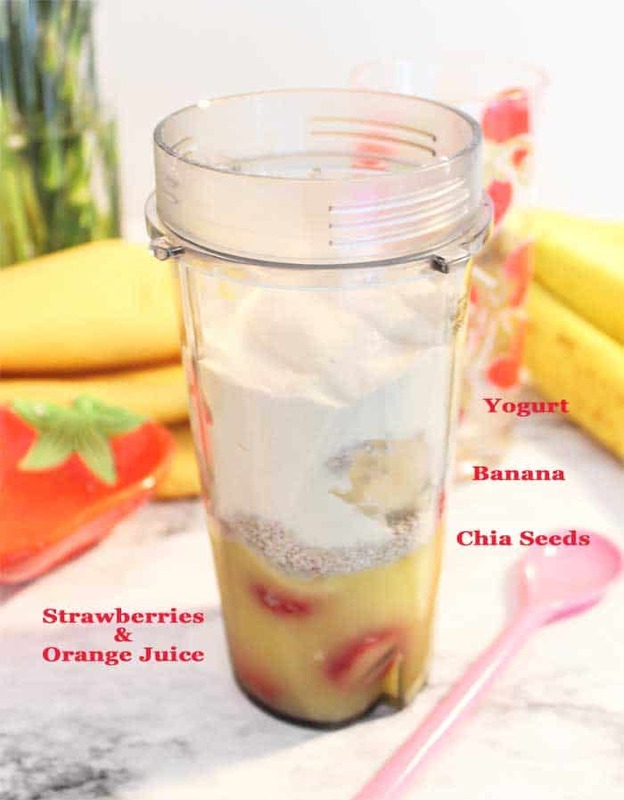 This Strawberry Banana Smoothie is not only delicious but easy to make and healthy too! A recipe that combines all things summer, strawberries, orange juice and bananas. It's the perfect breakfast to start the day. Combine all ingredients in blender and mix until smooth. Pour in glass and enjoy! This post has been updated with new photos and information. It was first published on February 27, 2014. Disclosure: This post may contain affiliate links. I receive a small commission to help me with my overhead when you make a purchase using my link. Check out Spectrum Essentials Chia Seeds on Amazon.com. 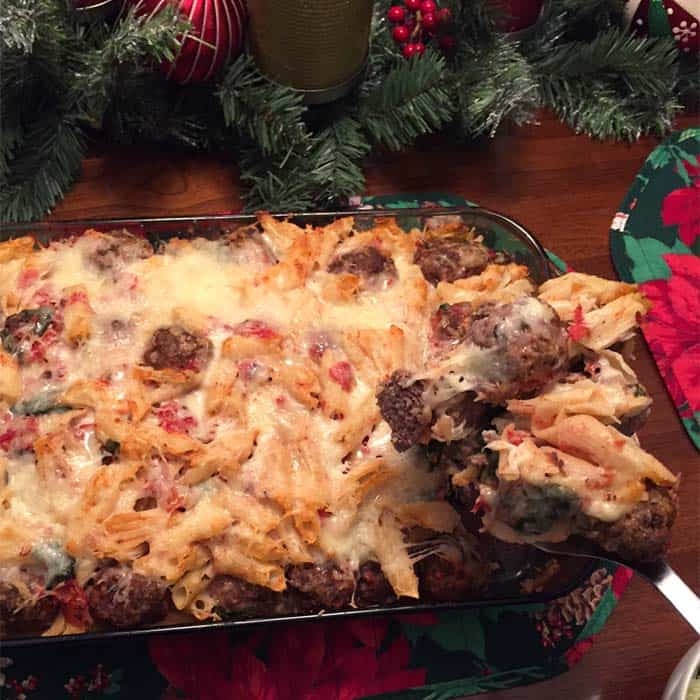 I give this recipe 5 stars. It’s amazingly fruity and delicious! This is so fresh and fruity! I love how this sticks with me all morning and I don’t get hungry before lunch! My daughter fell in love with strawberry banana smoothies on a recent trip. 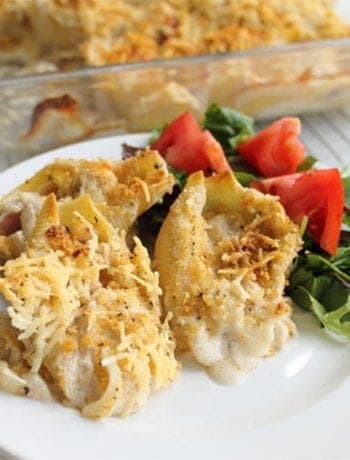 I was so glad to find your delicious recipe—she loved these, too!